The minister questioned whether the station was doing anything different or better than its competitors. COMMUNICATIONS MINISTER PAT Rabbitte has said questions need to be asked about whether 2fm is doing something better than its competitors. Commenting on the stations drop in ratings in an interview with Pat Kenny on Newstalk this morning, the minister said he would be reluctant to express his personal opinion on the matter because of his position. “That’s a question that does require to be asked and I’m sure is being probed,” he continued. 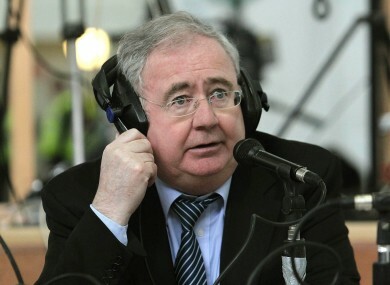 Rabbitte said that the broadcasting environment was very different when the station was established and “in the time of the late Gerry Ryan, it was bringing in a lot of revenue to RTÉ”. However he pointed out that the constant change in the advertising sector in recent years has created a much more competitive market. In his interview, the minister also responded to reports earlier this week about criticism from RTÉ’s chairman Tom Savage about the decision to cut the free TV licence to save money in the social welfare budget. The minister conceded that the manner in which it was decided to levy the €5 million was “very damaging to RTÉ at that particular juncture”. He said it was “not good policy-making” to do this at a time when the broadcaster was already restructuring itself, cutting costs and reducing staff numbers. Email “Rabbitte: Questions need to be asked about what 2fm is doing”. Feedback on “Rabbitte: Questions need to be asked about what 2fm is doing”.